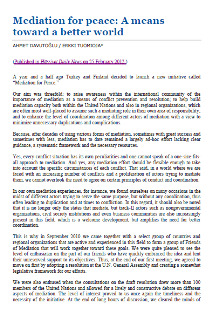 The Group of Friends of Mediation was founded on 24 September 2010, to promote and advance the use of mediation in the peaceful settlement of disputes, conflict prevention and resolution, as well as to generate support for the development of mediation. The members of the Friends of Mediation are committed to promoting a culture of mediation in their national policies, as well as regionally and internationally. Raise awareness of the need for and utility of mediation at all stages of the conflict continuum especially with a view to preventing conflict. Encourage relevant actors, including regional and sub-regional organizations, to undertake mediation activities and to engage more women in mediation. Highlight the importance of the full and effective participation of women at all stages and at all levels of peace processes as well as the crucial role of gender expertise in mediation. Provide a forum to bring together expertise and to share lessons learned between different actors. Create, foster and expand the network of mediators. Improve cooperation and coordination amongst different actors, in order to increase complementarity and coherence of efforts. Increase the capabilities for mediation, especially within the UN framework. Promote mediation-related capacity building, including through regional arrangements and networks. Promote the development of guidelines and/or a code of conduct for mediation, taking into account the specific nature of each conflict. Mobilize more resources in order to secure sustained funding for mediation activities. Support the development of early warning response capabilities. Provide political support to UN appointed mediators. The Group of Friends of Mediation currently consists of 50 Member States, the United Nations and 7 regional organizations and other international organizations. The Group is co-chaired by Finland and Turkey. The Group meets annually at Ministerial level in the margins of the General Assembly. It also holds regular meetings in New York, at the level of Permanent Representatives and Experts. Additionally, a network of focal points in the capitals/headquarters of the Members has been established, in order to further coordinate efforts. 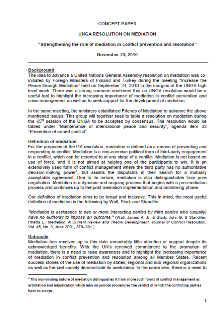 During the 65th session of the General Assembly, the Friends of Mediation tabled a draft, which subsequently became General Assembly resolution 65/283 on "Strengthening the role of mediation in the peaceful settlement of disputes, conflict prevention and resolution". During the 66th session of the General Assembly the Secretary-General submitted a report on the implementation of the resolution, annexed with the United Nations Guidance for Effective Mediation. 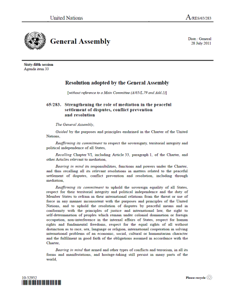 The General Assembly also adopted a new resolution (A/RES/66/291) in which it decided to continue consideration of mediation on a biannual basis. 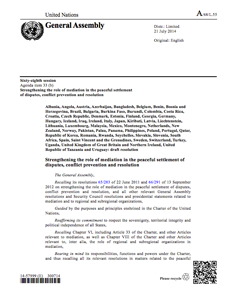 During the 68th session, the General Assembly encouraged the United Nations and regional and subregional organizations by adopting General Assembly Resolution 68/303 to continue to develop their mediation capacities; use United Nations Guidance for Effective Mediation in their efforts; increase awareness of the importance of mediation through conferences, seminars and workshops; and to ensure women’s equal and full participation in all forums and at all levels of the dispute settlement and conflict resolution process. It also asked the Secretary-General to submit a report during the Assembly’s 70th session on cooperation between the United Nations and regional and subregional organizations on mediation. During the 70th session, the General Assembly passed a resolution 70/304 and requested the Secretary-General to submit a report to the Assembly at its seventy-second session on United Nations activities in support of mediation in the peaceful settlement of disputes, conflict prevention and resolution. 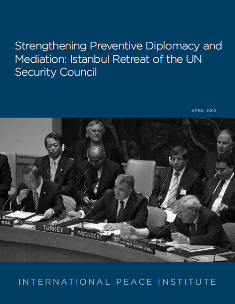 The report (A/72/115) analyses five elements of mediation support, providing examples of United Nations activities within the framework of each element. Since the adoption of the General Assembly Resolution 65/283, the Group of Friends has engaged in a number of mediation-related activities and discussions. For more information on these activities, see key documents of the Group of Friends. Algeria, Austria, Bangladesh, Belgium, Bosnia and Herzegovina, Brazil, Bulgaria, Burkina Faso, Canada, Colombia, Costa Rica, Denmark, Djibouti, Germany, Honduras, Hungary, Indonesia, Iraq, Ireland, Italy, Japan, Kenya, Liechtenstein, Lithuania, Malaysia, Mexico, Montenegro, Morocco, Nepal, Netherlands, Norway, Oman, Panama, Pakistan, Philippines, Qatar, Romania, Saint Vincent and the Grenadines, Slovakia, Slovenia, South Africa, Spain, Sweden, Switzerland, Tanzania (United Republic of), Uganda, United Kingdom, United States of America. 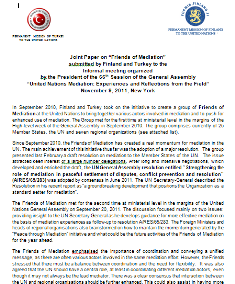 The United Nations is also a member of the Group of Friends of Mediation. The Ministry of Foreign Affairs of the Republic of Turkey organized the Fifth Istanbul Conference on Mediation on 30 November 2018 under the theme of “Enhancing the Practice of Mediation for Sustaining Peace”. The Conference was held under the patronage of H.E. Mr. Mevlüt Çavuşoğlu, the Minister of Foreign Affairs of the Republic of Turkey.